Live – ‘knowing’ you will die! To understand Life, understand the certainty of death. It is the only thing you can be sure of in this lifetime – that you will die! Once you understand death, you will live fully, intensely, celebrating each moment that you are alive! The conditioning, however, that all of us have had has led us to fearing death than accepting it. Death is presented to us as something that’s horrible, grave and sorrowful. So, we grown up fearing it. And therefore we don’t really live – for how can you live, forever cowering with fear, of a death that you certainly can’t avoid? There’s an insane political drama playing out in Tamil Nadu politics where Dravida Munnetra Kazhagam (DMK) patriarch M.Karunanidhi has expelled his older son M.K.Alagiri from the party ostensibly because the latter wished for the death (a charge that Alagiri has denied) of the former’s younger son, M.K.Stalin. The brothers have been sparring publicly for a long time now – to the extent that, especially with the ruling All India Anna Dravida Munnetra Kazhagam (AIADMK) firmly in power, the public at large hardly bothers about this sibling rivalry or the internal challenges that grip the DMK. But a charge from Karunanidhi saying Alagiri was “wishing Stalin’s death” certainly made Page 1 headlines. What I found interesting was not what the father and the older son were saying, but how calmly Stalin reacted. He said: “Everybody who is born has to die someday.” Political analysts don’t see Stalin’s retort as a study in profundity. Nor do I. I see it simply as the truth – stated aptly, appropriately. 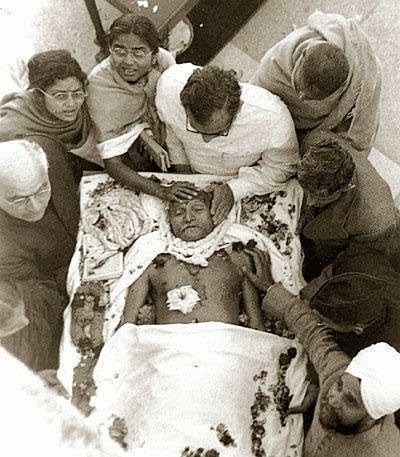 Today is also the day, 66 years ago, when Mahatma Gandhi was assassinated by Nathuram Godse. In a book being published shortly by Roli Books, titled, “My Experiment with Gandhi”, author Pramod Kapoor says that “Gandhi would often say – ‘Death is a celebration…the body falls and the bird within it flies away. So long as the bird doesn’t die, the question of grief should not arise.’” I believe this is the most profound understanding of, and a very beautiful explanation for, death. So stop fearing death. Rejoice in the awareness that you have of what the end-game is all about. Celebrate that your soul, your true Self, is non-perishable and that it will soon be free – when death consumes your body and ends your current lifetime. If we can understand this truth about death – and Life – you will live, than merely exist! Author AVIS ViswanathanPosted on January 30, 2014 March 14, 2016 Categories AIADMK, DMK, http://schemas.google.com/blogger/2008/kind#post, Inner Peace, Intelligent Living, M.K.Alagiri, M.K.Stalin, M.Karunanidhi, Mahatma Gandhi, My Experiment with Gandhi, Nathuram Godse, Pramod Kapoor, Roli BooksLeave a comment on Live – ‘knowing’ you will die!